• Cold-hardy wine grape varieties have spawned new small winery industries in the upper Midwest and Northeast over the past decade. • In Iowa alone, the industry has grown from 100 acres of grape vines and 14 wineries in the year 2000, to more than 1,200 acres and 94 wineries in 2011. New grape varieties can take more than 20 years to breed and evaluate, and even longer to reach commercial success. Established winemaking areas have been perfecting their processes for decades. Areas such as Iowa, relatively new to making wine, have far less experience. A recently awarded $2.5 million grant will help colder-weather states from Nebraska to Iowa to New York overcome obstacles in the vineyard, winery and tasting room and also improve tourism. The grant's focus is a group of extremely cold-hardy wine grape varieties, new to both growers and consumers. These grapes have spawned new small winery industries in the upper Midwest and Northeast over the past decade. In Iowa alone, the industry has grown from 100 acres of grape vines and 14 wineries in the year 2000, to more than 1,200 acres and 94 wineries in 2011. The research will examine how to determine the best growing conditions, modify the higher grape acidity and showcase wine's aroma, and build tourism networks to draw visitors to tasting rooms where the majority of sales take place. "This opens up opportunities for Iowa growers to become leaders in the production of premium cold climate wines," said Murli Dharmadhikari, director of the Midwest Grape and Wine Industry Institute at Iowa State. Iowa State University will receive more than $500,000 in funding for this project over two years. Ultimately, they hope the project will help convert startup wineries into sustainably profitable enterprises that can fuel rural economic development, said Dharmadhikari. Paul Domoto, professor of horticulture at ISU, will lead the viticulture studies group, and will work with Gail Nonnecke, University Professor of horticulture, on researching vineyard trials in Iowa. Jacek Koziel, associate professor of agricultural and biosystems engineering, will be part of the fruit composition and genetics group and study sensory profiling and volatile metabolites. Dharmadhikari will oversee fruit chemistry, winemaking trials, and also serve as a liaison to the project advisory council team. In addition, Dharmadhikari and ISU field specialist Mike White will serve on Extension and consumer-marketing teams. 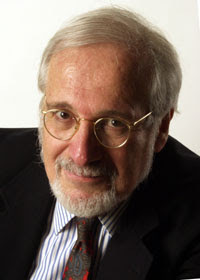 Paul Lasley, professor of sociology, will lead and coordinate project evaluation. The goal is to provide producers with research-based tools and practices to help them grow, vinify and sell quality wines to local and regional markets. Research will be led by Tim Martinson, project director and senior Extension associate at Cornell University, New York. The grant was funded by the by the USDA National Institute of Food and Agriculture Specialty Crop Research Initiative (SCRI), which supports multi-institution, interdisciplinary research on crops including fruits, vegetables, tree nuts and ornamentals. The consortium also includes researchers from Michigan State University, East Lansing; Oklahoma State University, Stillwater; North Dakota State University, Fargo; South Dakota State University, Brookings; the Connecticut Agricultural Experiment Station, New Haven; the University of Illinois, Urbana-Champaign; University of Massachusetts, Amherst; University of Minnesota, Twin Cities; University of Nebraska, Lincoln; University of Vermont, Burlington; and University of Wisconsin, Madison. Wilson Ward takes a sample of wine as it is fermenting at Fisher Ridge winery in Liberty, Putnam County. Fisher Ridge has produced wine since 1977. Courtesy of Matt Murphy. LIBERTY, W.Va. — For more than 30 years, a small Putnam County vineyard has been quietly producing wine because its founder made a simple decision. 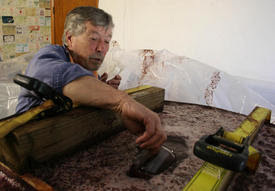 "I had always enjoyed wine, and I figured, 'Why buy wine when you can make your own?'" said Wilson Ward, a now-retired dentist who lives in Charleston. 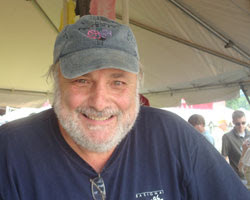 Ward established the Fisher Ridge Winery in the hills of northeastern Putnam County in 1977. It produced its first bottle in 1979 and since then, 19 other wineries have taken root in West Virginia. More than 30 years later, the Mountain State's vineyards, while small in number, are proving themselves statewide and regionally, one cork at a time. Ward first became interested in wine when he was in dental school at West Virginia University. He pursued that interest as his professional career began. He became interested in making wine on his own after he served a stint in the Public Health Service in California. About a decade before Ward opened Fisher Ridge, he joined a group of home winemakers who learned the trade together. Ward said the production eventually "got away from him" — and Fisher Ridge was born. Since putting a cork in that first bottle, Ward has seen his business grow substantially, becoming one of the most well-known operations in West Virginia. The wines produced at Fisher Ridge are sold only in West Virginia because of interstate commerce rules by the federal government. Selling in other states would mean obtaining an additional permit — and paperwork — that doesn't interest Ward. But in West Virginia, Fisher Ridge has seen significant recognition, Ward said. 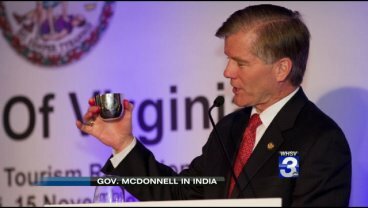 Governor Bob McDonnell and First Lady Maureen McDonnell hosted a reception in Mumbai earlier this week to promote business, tourism to Virginia and Virginia wines. In attendance was Sanjay Menon, one of India’s top wine importers, retailers and connoisseurs, who gave a glowing review of Virginia wine, adding to the international acclaim for Virginia’s growing wine industry. Sanjay Menon has made the Decanter power list top 100 personalities in the world wine. Mumbai was the first stop in a three city tour of India which included Delhi and Bangalore. At the reception, Menon guided the guests through red and white wines from Virginia, including wine from Barboursville Vineyards, Narmada Winery, Trump Vineyard Estates, Breaux Vineyards and Horton Vineyards, highlighting the properties of each of the wines. More than 150 Indian wine importers, dealers, sommeliers and journalists, along with representatives from India's tourism and travel agencies attended the event. The Governor raised a symbolic toast in a special ‘Jefferson’ cup to strong ties and friendship between India and the state of Virginia. Thomas Jefferson served as Governor of Virginia and President of the United States of America and is widely credited with being America’s first wine connoisseur. 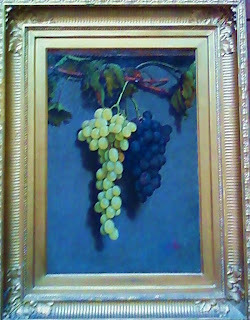 Grapes brought from Europe were planted at his estate of Monticello. In her address, First Lady, Mrs. Maureen McDonnell touted Virginia wine and tourism destinations. Also present at the gathering were Diane, Bechamps, Vice President of Marketing, Virginia Tourism Corporation, Hon. James S Cheng, Secretary of Commerce and Trade, Hon. Todd Haymore, Secretary of Agriculture & Forestry and Hon. James D Duffey, Secretary of Technology and other members of the Virginia delegation. On August 2, 2011 Governor McDonnell announced a wine export agreement between Barboursville Vineyards and Tianjin Tewoo Group. The deal, a result of the Governor's trade and marketing mission to Asia in May where seven Virginia wineries were highlighted, is believed to be the first commercial transaction between a Virginia winery and a Chinese importer. Sales of Virginia wine reached an all-time high in fiscal year 2011 with more than 462,000 cases sold during the fiscal year. This figure marked a sales increase of more than 11% over the previous fiscal year. Virginia is now the nation's fifth largest wine producer and seventh largest wine grape producer. According to the most recent economic impact study, the Virginia wine industry employs approximately 3,000 people and contributes almost $350 million to the Virginia economy on an annual basis. © Copyright 2011 WHSV / Gray Television Group, Inc. All Rights Reserved. This is not the first time I've written about Rappahannock Cellars. 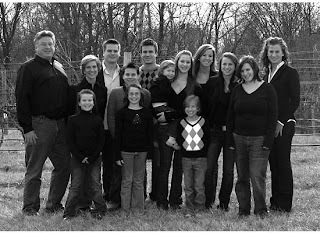 Remember this family? They moved from California to Virginia? This is one of the most fascinating stories out there. On the other hand, nice story or not, you need to make good wine. Hopefully great wine. Well, a friend of mine, Steve Casscles, and I went down to the wine cellar the other day and decided to do something a little different. He was in the mood for an older east coast white....what did I have down in the basement? So down we went and looked through the old, dusty collection I have down there. I was happy to try and meet the challenge, because I have been trying to drink some of my older east coast wines to see how they hold up. So far, there were many pleasant surprises. And there among the bottles was a 2000 Viognier from Rappahannock. I wasn't sure. I mean, how many people actually drink an 11 year old wine, let alone an 11 year old white? We got the shock of our lives. We poured the wine anxiously into some Riedel glasses. We figured, if the the wine was good, it deserved the glass. Wow! The nose was overwhelming - dried apricot, honey, mango, and very strong. It smelled like a great sauterne! And then we tasted. Even bigger wow! All the same flavors came through but the wine was as dry as could be. It was one of the most incredible white wine experiences I could imagine! 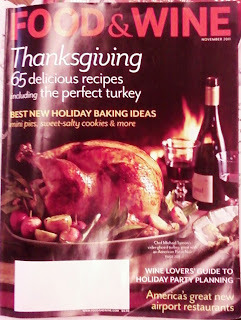 We ate goat cheese and french bread at the kitchen table among the opened and unopened mail in our cluttered country house. The cats were wlking around. The kids were racing through the kitchen yelling "Dude" to each other abd raiding the fridge. Steve and I just ripped off big piece of bread, and ate the cheese and drank the wine. Viongier is a tremendous gift from Virginia to the the rest of the US. The viogniers from this region obviously hold up. adly, it only took us about 20 or so minutes to finnish the bottle. Kinda sad. But these things don' last forever, and the day had to move on. Worst part was my wife threw out the bottle before I could photograph it!! Lol!! Hats off to the Delmare family! Congrats ona tremendous wine! A great wine! And congrats to Virginia as well! Below is a reprint of a post written by New York Times wine writer Howard G. Goldberg about his notes on a recent tasting of Hudson Valley wines. As the beautiful Hudson Valley's remaining leaves turn further red, ocher, yellow and rusty, and crunchy underfoot, I recall and envy landscape painters of the 19th-century Hudson River School -- (its founder) Thomas Cole, Frederic Edwin Church, Albert Bierstadt -- who recorded the unspoiled region's majesty. Not having visited the area for some years I miss annual excursions to Millbrook, my friend John Dyson'simpressive, sprawling wine estate, and occasional trips to Clinton Vineyard, in Clinton Corners, another Jewel, established by my friend Ben Feder (now gone) and nurtured by Ben and Phyllis, his remarkable wife. By now some of Carlo's and others' wines I tasted have yielded to later vintages, which, on the basis of my tasting, I'd be pleased to explore too. My favorite was Warwick Valley Winery's nonvintage Black Dirt Red, an exuberant, succulent baco noir. Close behind was Hudson-Chatham's 2008 Empire Reserve Red -- a clever, grapey, nuanced blend of Hudson Valley baco noir, Finger Lakes cabernet franc and Long Island merlot. Next came Benmarl Winery's lovely, virtually sweet, lightly smoky, balanced 2009 baco noir. Followed by Hudson-Chatham's 2009 Masson Place Vineyard, Pulteney Farm, Old Vines baco noir, which was succulent and juicy. (light, good varietal character, stylish) and 2008 cabernet franc (dense, earthy, spicy). Then Hudson-Chatham's 2009 seyval blanc -- I have loved the grape and wine, from various producers, for years -- had a firm acid grip, perfumed nose and a tangy citric bite. Benmarl's 2009 Slate Hill White, a blend of chardonnay, riesling and traminette, had a luscious texture, gooseberry-like acidity and a tangy grapefruity flavor. Hudson-Chatham's rustic 2009 Casscels Vineyards chelois was pretty,opulent, a little cherry-like and seemed dotted with herbs. It was inward, and I had to aerate it a lot on my palate to get, rewardingly, at its character. Hudson-Chatham’s 2009 Casscels Vineyards baco noir reserve was a juicy, gutsy knock-back carafe wine. Whitecliff Vineyard’s 2009 gutsy gamay noir struck me as somewhat Beaujolais-like. While tasting it, I wanted to wash it down with a burger. The 2010 gamay noir, very light and best chilled, was a pleasant carafe wine. The 2005 pinot noir from Oak Summit Vineyard, in Millbrook, a property wholly unknown to me, suggested that high seriousness was present and that subsequent vintages ought to be tracked. Clinton Vineyard’s Cassis (half-bottle), an excellent dessert wine that oscillates on the palate between sweetness and dryness, was lean, dense and showed real breed. A fitting climax. I would have brought the painter Thomas Cole along if a biographical fact hadn't gotten in the way: (1801-1848). Basignani Vineyards Celebrates 25 Years With Grand Tasting! To Bert and Lynne Basignani it seems like just yesterday that they planted their first vines - in 1974! They opened their winery 12 years later in 1986. 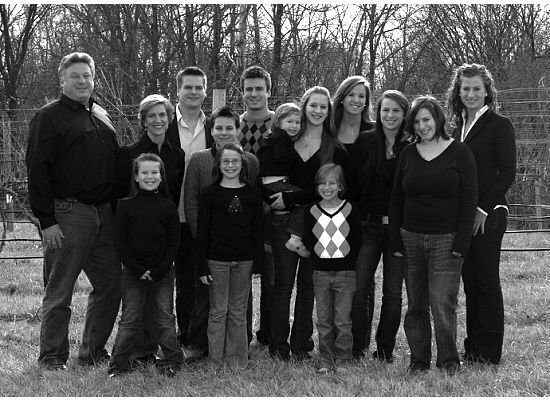 25 years later they are still following their passion, making award winning wines, and being one fo the eladers in the local quality wine movement in Maryland. The other day Dominique and I opened a teriffic bottle of wine. 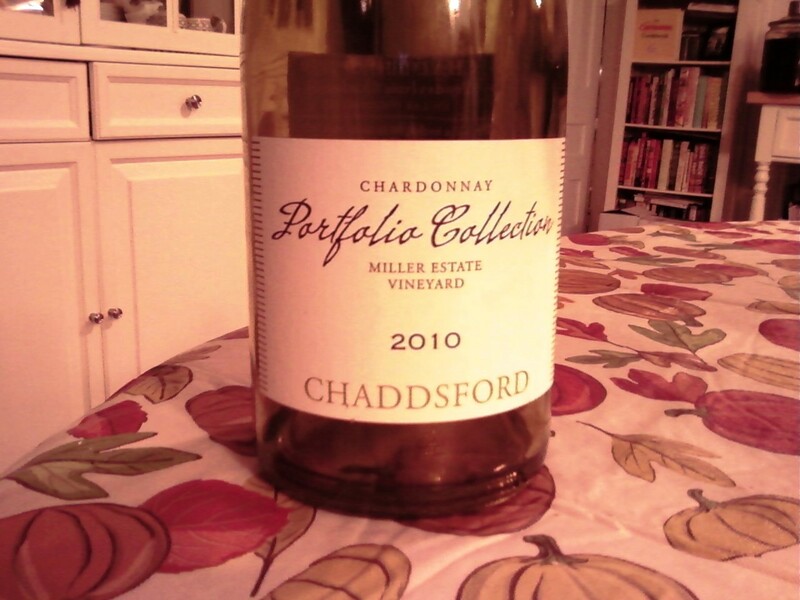 It was a special present from Eric and Lee Miller at Chaddsford Winery from Pennsylvania. And we shared with a friend, Steve Casscles. We sat in front of the fireplace with a plate of cheese (Hudson Valley creameries - fresh goat cheese and soft rind camembert) with a loaf of fresh baked bread. We opened the bottle and poured ourselves some nice pours of this wine. This is a small production wine. The color is a beautiful golden white wine. A big nose of green apples and melon, with a hint of honeysuckle. There was also a hint of vanilla. A touch of spice at the end. This was an exceptional wine. Fantastic. Eric Miller has done it again. 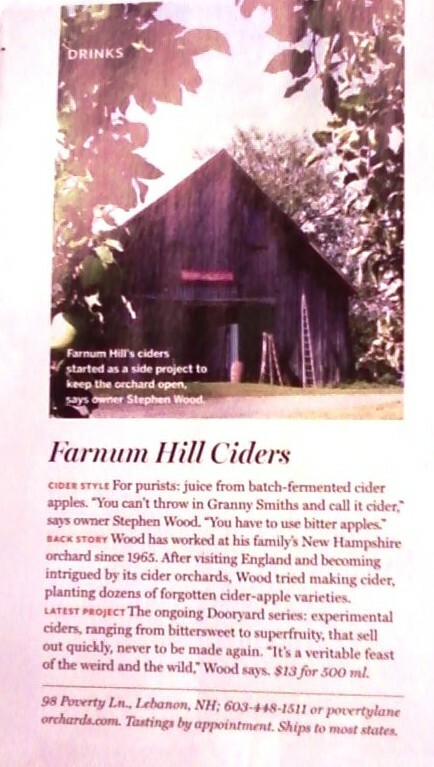 Farnum Hill in New Hampshire and Slyboro Cider House in New York were both singled out in a major piece about ciders across America. 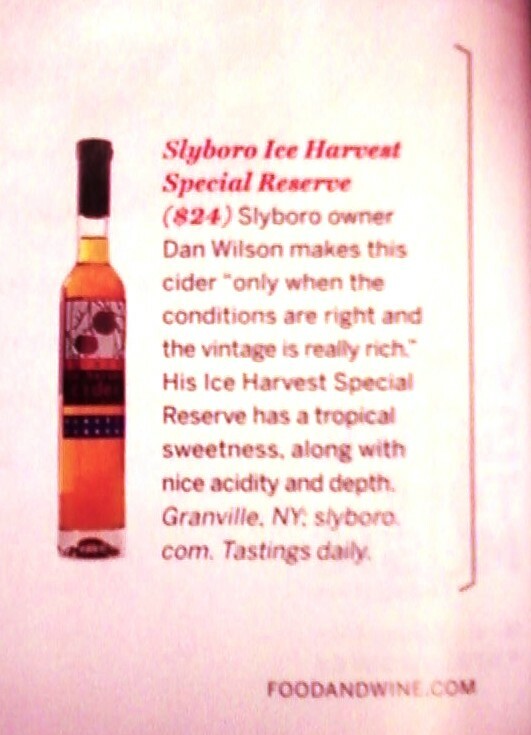 Congrats to both wineries! Both make fabulous ciders, from sparkling to dessert styled wines! There’s a wonderful scene in Annie Hall when Alvie (Woody Allen’s character) as a young boys is sitting with his mother in the doctor’s office. The Doctor is asking Alvie what’s bothering the young boy. “The Universe is expanding…” says the perturbed young boy. “What does that matter?!. We live in Brooklyn! Brooklyn is not expanding!” yells the vexed mother. But indeed, the Hudson Valley is expanding. 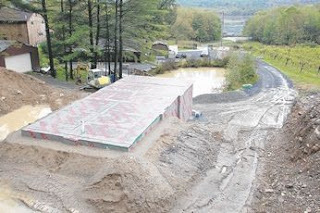 Five wineries in the last 9 mos have begun major expansions, to help handle the growing demand for Hudson Valley wine. And the biggest evidence of that is watching five quality fine wine producers begin major expansions. The first and foremost (because it is nearly done) is that of Whitecliff. Whitecliff is owned by Michael and Yancey Migliore. The winery is nearing its tenth year of operation, and to celebrate, they built a new, state of the art winery, complete with geothermal heating, offices, and enough space to do custom crushing. According to Debbie Gioquindo, Michael Migliore, owner/winemaker said they outgrew their original space and needed to build a new winemaking facility to handle the capacity to be able to grow. 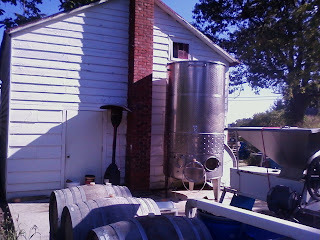 "Three years ago we were a 3000 case winery, now we are a 5500 case winery and growing. Not only do we do our own, this enables us to do custom crush and make wine for other facilities," Michael told Debbie, the Hudson Valley Wine Goddess. "It was so nice to have the space and the room,” said Michael. “and to be able to increase capacity. We had tons of room to process grapes more than we had before. It was so nice to be able to process inside when weather was bad." Brotherhood Winery is America’s oldest winery, located in Washingtonville, NY. 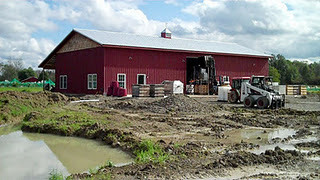 Brotherhood is one of the largest wineries in the Hudson Valley, or the state in for that matter. Their new construction will almost double there already massive capacity. There are six 5,000 gallon tanks. Then there are two more that hold even more wine! This is additional capacity on the massive gallonage they already produce. 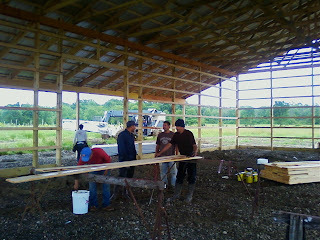 Construction continued in mid-October with the pouring of the footings in the winemaking facilities. This is major news in the valley. The event in and of itself was so large that Bortherhood and their construction company invited guests to the groundbreaking. 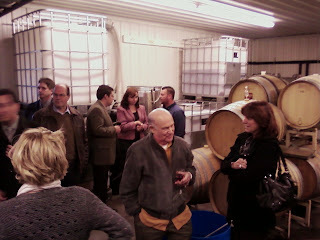 Tousey just recently unveiled their revised and expanded winemaking facilities the other evening. Tousey is new to the Hudson Valley winemaking scene, but the new facilities and equipment make them an immediate player in the Hudson Valley fine wine scene. New shining stainless steel tanks, new machinery, and tons of new flex tanks show that the winemaker has more than tripled in size in the last year-and-a-half. 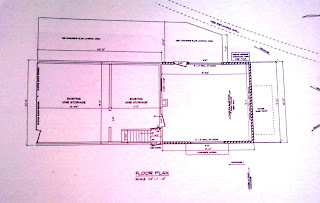 Hudson-Chatham Winery, after a prolonged five month long delay with red tape and planning officials, is now about to double its capacity, adding 22 x 22 foot expansion, as well as adding another separate building (added barrel room capacity), to double is winemaking capacity, and allowing for extra retail space in its retail area as well. 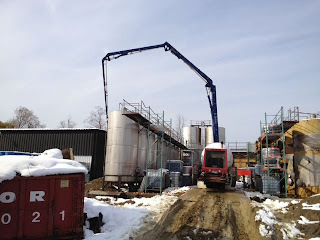 The new buildings will house several new tanks and new winemaking equipment. All this activity augers well for the Hudson Valley and for the demand for the quality wines of the Hudson Valley.